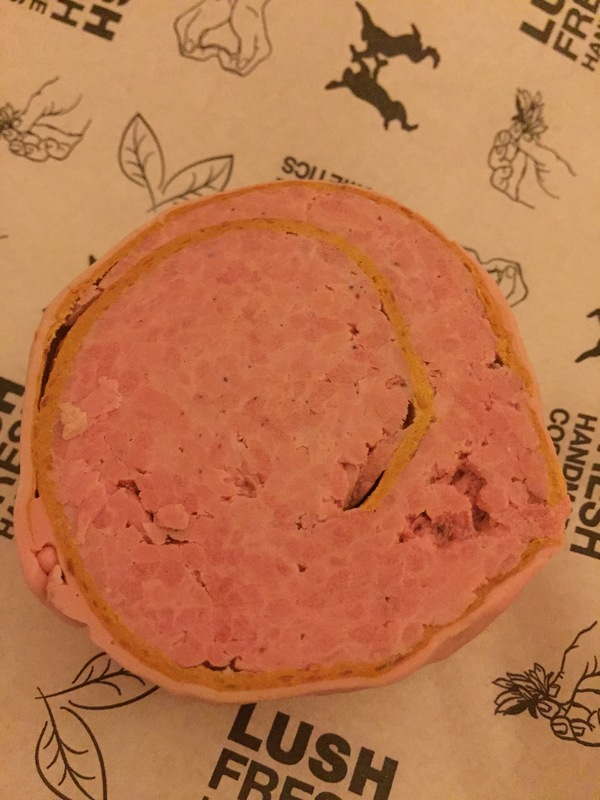 Roulades are quite a new design from lush first making their appearance at the opening of the Oxford street store. They are basically a reformulation of the shower smoothie. lush try their hardest to make product with as little packaging of possible so this reformulation is the perfect way of still enjoying the shower smoothie but with out the packaging. 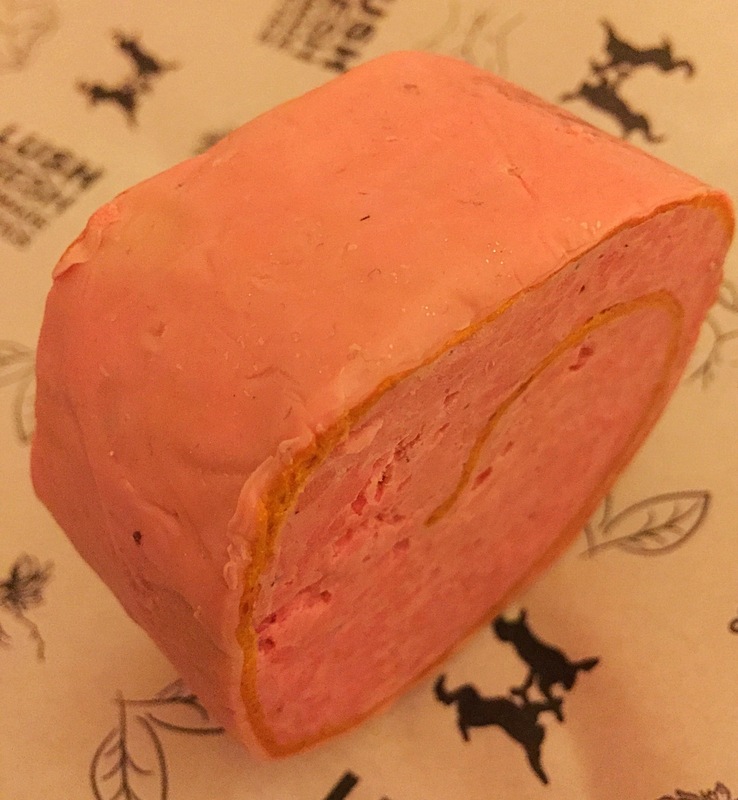 As part of the 2015 Christmas range lush released a Christmas version of this newly invented shower roulade. 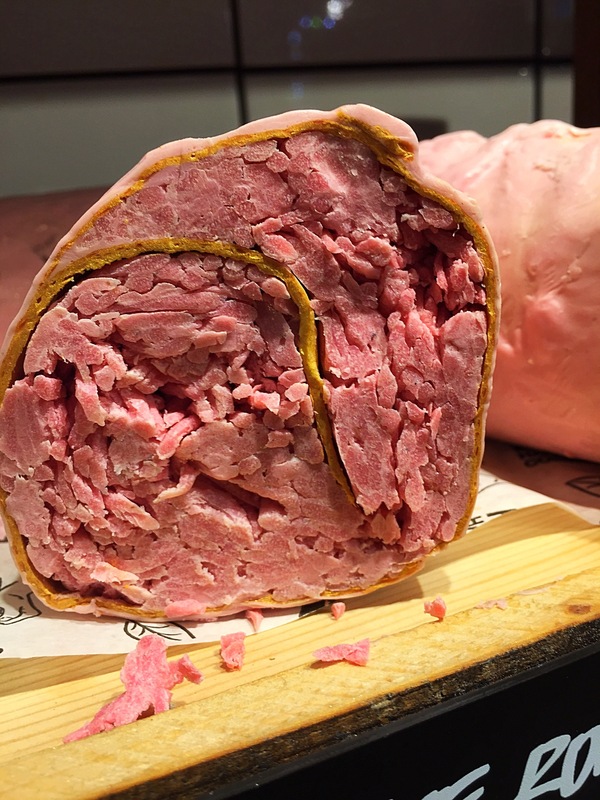 The Icing on the Cake Roulade is a baby pink colour and looks like some very yummy pink icing covered cake. In store the roulades are in big rolls and the staff are then able to cut you the desired amount just like with the soap. I must admit the new roulades are much more pretty to look at than the older versions which are found in black pots. Scent wise I was exspecting the Icing on the Cake roulade to have a very sweet sickly almost icing like sent. I almost even possibly expected it to have the much loved snow fairy scent. I was however pleasantly surprised to find this wasn’t the case at all and the roulade shared its scent with the ponche shower gel from the 2014 Christmas collection. Containg a vast amount of fresh ingredients including orange peel, Buchu oil, coconut oil and chestnut Puree the icing on the cake roulade has a fresh and fruity scent with a citrus twist. The new design roulades can be used in several ways, you can either pinch a little part off or you can use the entire lump like a peice of soap. Although i do like the new concept, I do think I prefer the old design of the smoothies a little better. I find the old version a little easier to use. However i still really enjoyed using the new roulade and I did find that it lathered very well and left a beautiful sent on the skin which lingered for quite some time. Overall I was very impressed with my first roulade and am looking forward to trying some others that are available. Have you tried any roulades? What did you think? Ingredients – Glycerine Rapeseed Oil, Coconut Oil,Almond Milk, Fresh Orange Peel, Lime Peel and Lemon Peel, Soya Cream, Chestnut Puree, Water, Perfume, Almond Oil, Fair Trade Organic Cocoa Butter, Davana Oil , Buchu Oil, Petitgrain Oil, Titanium Dioxide, Sorbitol, Sodium Chloride, EDTA, Tetrasodium Etidronate, Sodium Hydroxide, Cinnamal, Coumarin, Eugenol, Geraniol, Limonene, Linalool, Calcium Sodium Borosilicate, Tin Oxide, Colour 17200, Colour 45410, Colour 14700.